Solitude used to come easy to me. I’m enough of an introvert that even as a child I preferred spending hours staring at a world atlas to playing outside ot looking for new friends. When I went to seminary and started out in ministry, I was encouraged by mentors and professors to seek out solitude. By drawing close to God when alone, I was told, we experience healing from the wounds of ministry, freedom from the temptation to perpetually please people, and clarification of our vocation. Most importantly, solitude lets us attend to the still small voice of the One who loves us perfectly. Years ago I found it easier to make space to be alone with the Alone. I had a group of friends who believed the same things and supported one another in taking regular retreats, sharing what we were learning about prayer, solitude, silence, and Sabbath. My stage in life back then gave me more freedom to practice Sabbath and take retreats. And then life happened. Nearly one year into my second pastorate, I’m noticing that I have a new, less easy relationship with solitude. Several things have changed. I’ve been married for twelve years and have been a parent for four and a half of those years. I’ve become accustomed to having little to no solitude at home. Chatter, interruptions, crying, and laughter perforate any sense of continuity or concentration I could have at home. As any parent knows, this cacophony can be hilarious and joyful at one moment and agonizing at the next. This has been the new normal for a while, so long in fact that when I am given an afternoon at home alone my first impulse is to clean or do laundry or fix one of the dozen things on our list of projects. Hence the paucity of posts on this blog recently, and why I’ll finish this post after I install a new shower-head in our children’s bathroom. . . .
Several days later, I’m back. Another difference: While there’s less solitude at home now, I have more solitude at work than in recent years. 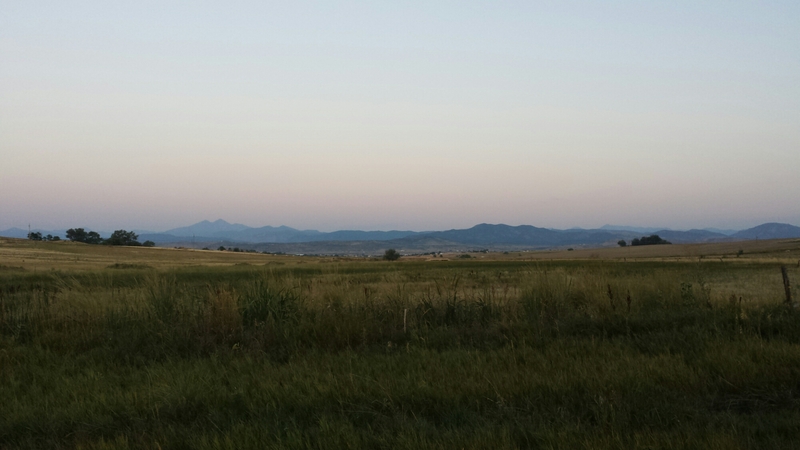 I’m new enough in Berthoud that I’m not overwhelmed by relationships wherever I turn. This is great for being an introvert, but it’s not the same as solitude. In pastoral work it can actually produce a loneliness to which I’m unaccustomed. In Pittsburgh it seemed impossible for me to be lonely: I had a co-pastor, co-workers in my other jobs, a network of friends and colleagues, and of course my family. In Colorado, I’m a solo pastor, and while I’m slowly becoming friends with other local pastors, it’s quite different than when we all went to seminary together and ended up staying within a 15 mile radius. Perhaps this is why last week I went to a local pastor’s gathering and found myself uncharacteristically (and counter-productively) anxious for people to like me. This happened only minutes after I told a friend on the phone that I don’t feel lonely here. Perhaps I’m wrong. All of this – the clamor of home life, the incomplete solitude of work, and the anxious worry about what others think – all this means it’s time for a retreat to authentic solitude. So next week I’m going camping by myself. And I’m going camping in mountain and desert terrains because I need to let go for a few days. In the language of both the desert fathers and Ignatius of Loyola, I need to practice detachment. Belden Lane argues that the characteristic detachment of desert spirituality owes in large degree to the terrain itself. But it’s not because the landscape is calm or soothing, or so beautiful that we forget about our other cares. It’s because the land itself doesn’t care about us. In Lane’s words, “We suppose arid and empty terrain to be naturally solicitous of our human need for contemplation. But the stark, unsettling truth is that the desert doesn’t give a damn. Its capacity for indifference seems almost infinite.” (The Solace of Fierce Landscapes p. 187). Deserts and mountains and oceans remind us how small we are, how immense God is, and how little our petty distractions truly matter. Every day in Berthoud, I look up at Long’s Peak and Mount Meeker (in the middle of the large picture above) and I marvel at their changing appearances. One day they’re covered in snow, the next day I see cracks opening up and gray rock exposed as the snow melts. One minute it’s clear and the peaks are completely visible. Soon clouds have blown in and appear to be dancing around and between the mountains. Sometimes they’re glowing from the sunrise, or backlit by a fiery sunset. All the worries and cares of daily life are like these changing conditions. The have subtle effects on the mountains, but little change actually happens. Erosion, rock-slides, avalanches, and other factors change mountains, but they take millennia to completely change a landscape. That’s why Martin Laird, in his book Into the Silent Land, invites us identify with the mountains. God, through the Incarnation of the Son of God and the gift of the Holy Spirit, dwells within us. When we detach from the world through contemplative prayer or other ascetic disciplines, we dive deeper into the center of our being where the unmovable God dwells. So Laird writes “The marvelous world of thoughts, sensation, emotions, and inspiration, the spectacular world of creation around us, are all patterns of stunning weather on the holy mountain of God. . . . . When the mind is brought to stillness we see that we are the mountain and not the changing patterns of weather appearing on the mountain” (p. 16). To put it in Biblical terms, “Those who trust in the Lord are like Mount Zion, which cannot be moved, but abides forever” (Psalm 125:1). So, after a coaching visit to a new worshiping community in northeastern Wyoming this weekend, I’m going into solitude. I plan to spend a couple days in the Badlands of South Dakota and maybe in the Medicine Bow Wilderness of Wyoming. Then the plan (so I think) is to reenter the world gently, first by attending another retreat hosted by the Presbytery of Wyoming’s Sabbath Center with a few friends and colleagues. And then I’ll be home to family and church and life in the newest normal. Your prayers would be appreciated. I look forward to sharing both the fruit and the failures of this foray into solitude. A Path Revealed recounts the diagnosis of Maddux’s wife with Alzheimer’s disease, and the unlikely but very necessary spiritual journey which followed for Carlen. I read A Path Revealed this fall while also reading two other books that related to the spirituality of aging. In Pittsburgh I co-pastored a church plant made up of mostly Millennials. At the present time in Berthoud, I’m pastoring a traditional church with people who could be the parents or grandparents of my former congregants. Maddux’s journey, I learned, is not unlike the journeys of a few of the saints in our congregation here. Taking another step to familiarize myself with the concerns congregational demographic, I invited them to study another book with me: Johann Christoph Arnold’s Rich in Years. Like other books by Arnold, Rich in Years addresses difficult topics with remarkable simplicity. When you suffer tribulation, keep in mind that you must do so in such a way that it is not just a victory for yourself but a victory over suffering in general. I have experienced this among epileptics, among the blind, the lame, and the deaf, and in general among the so-called incurably sick. I tell them: Be glad you are like this. Now bring something of Jesus’ death and his resurrection into your situation . . . Then you will help to gain a victory for the whole world. Our book group found “Be glad that you are like this” to be insensitive and harsh advice. We didn’t argue with the idea that suffering can bring about our sanctification. But we were reluctant to rejoice in it, or to romanticize it in the way that some felt Arnold did. The sanctifying power of suffering is treated with deeper empathy in both Maddux’s A Path Revealed and in Belden Lane’s The Solace of Fierce Landscapes: Exploring Desert and Mountain Spirituality. One part memoir of his mother’s final years with Alzheimer’s, one part academic history of desert spirituality, and one part travelogue, The Solace of Fierce Landscapes is a rare book. Because Lane blends rather raw narrative of his own experiences of both suffering and contemplative prayer with a studied assessment of the writings of the saints on these topics, The Solace of Fierce Landscapes was the most compelling book of these three. While Maddux and Arnold present simpler visions of the journey through personal wastelands into deeper faith, Lane’s presentation is complex, nuanced, and still mysterious. While Arnold invites readers to encounter God in their suffering, and Maddux shared his personal experience of that encounter, Lane goes beyond those levels to thoroughly introduce the reader to the practice of contemplative prayer as the place of such encounter. Different as these three books are, their commonalities have been instructive for me as I’ve started pastoring a congregation more well “acquainted with grief” (Isaiah 53:7). Illness, death, grief, and other sufferings can be used for deepening our spiritual maturity and sanctity. Such growth requires a willingness to yield to God’s sovereignty and God’s purposes, to genuinely encounter God rather than trying to comprehend or control him. And the place to cultivate such submission is in the desert, whether figurative or literal. Silence, solitude, and desolate landscapes remind us of the grace that God is God and we are not. Our experience of moving home to Colorado has likewise felt like being brought out into a broad place, and not only because the streets are wider and straighter than any in Pittsburgh. We loved (and very much miss) Pittsburgh, but our pace of life there left me feeling both wearied and claustrophobic. The pace of life here in Berthoud is more gradual and gentle. That’s partly because I am now serving an older congregation. But there’s more that makes this feel like a broad place. Our last weeks in Pittsburgh are a blur befitting the frenetic pace of our life there: saying goodbyes to jobs and friends, preaching my final sermons at The Upper Room, shooting a video to promote a new seminary certificate program, moving out of our house, volunteering at the New Wilmington Mission Conference. On our last day in Pittsburgh, I left the New Wilmington Mission Conference, served communion at my best friend’s mother’s memorial service, drove my wife and daughters to the airport, picked up my father and began a three day cross-country drive through the broad place of middle America. That drive through rolling Ohio hills to flat fields of corn and soybeans that lasted all the way to Kansas was healing for my soul. The Great Plains are full of space – space to breathe, to pray, to be still. I needed that drive to slow down, to catch my breath, and to prepare for a new life here in Colorado. 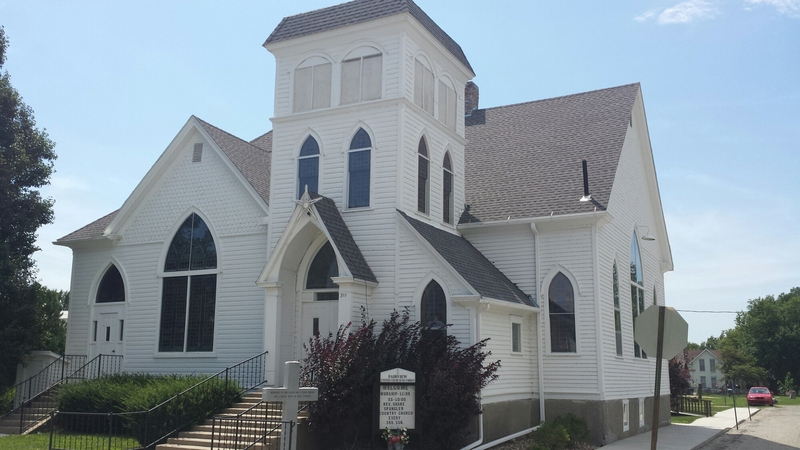 In Fairview, Kansas, we stopped to see the church my great-grandfather pastored a hundred and ten years ago. James A. Hunsicker was born in Pennsylvania, but his pastorates moved further West with every new call. After several years in Kansas, Grandpa Hunsicker moved to Colorado to be a fruit rancher, teacher, and pastor. A few days after arriving in Berthoud, I took my oldest daughter to a family gathering at the church he founded in Eckert, Colorado. 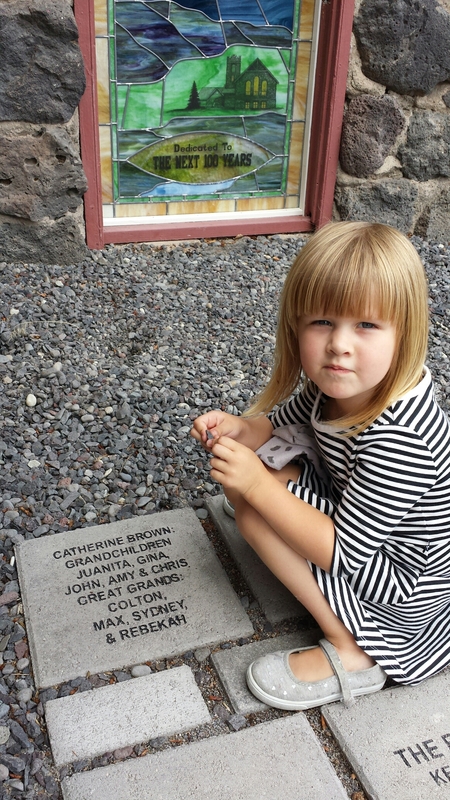 Seeing her in the portion of the church’s garden which commemorates their centennial anniversary, I couldn’t help but think that the Lord led our family out into a broad place generations ago, and now he’s led us along a similar path. So what does life look like in this broad place? It’s not all empty space. Today I prepared to interview our church’s next secretary, visited two homebound members, and met with the mayor to ask how our church can seek the well-being of the whole town. Today was a full day, but it didn’t feel like I was striving or forcing anything. Another translation of Psalm 46:10 says, “Cease striving, and know that I am God.” Such steadiness, peace, and trust is ideally possible in any context, but I’m finding it easier here, and I’m grateful to be entering a season of life where the Lord is letting us live in such a broad place. Back in September, I listed seven books which contemplative church planters ought to read. Now I’m adding one more to the list. I requested a review copy of Starting Something New: Spiritual Direction for Your God-Given Dream because the title resonates so well with our approach to developing new Christian communities. Planting a church is about listening to the Holy Spirit as God sends us out into mission. We can’t do such ministry faithful unless we’re attentive to God’s voice. Spiritual direction helps us learn to live with such attentiveness. Starting Something New offers a taste of such direction for those who would read it as they participate in the formation of a new ministry. As Booram writes, “This book is intended to be a companion guide offering spiritual direction for those who are wondering if they have a God-given dream forming inside them but don’t know what to do with it” (p. 14). Booram succeeds in providing such direction in many places, consistently relating the principles she describes to points in her own journey or to the stories of over a dozen other Christian leaders whom she interviewed for the book. Each chapter addresses a different stage in the birth and growth of an emerging ministry and is followed by questions for inward reflection. All of this is laced with generous amounts of cheerleading for those who may not have the courage to follow their dreams. But how do we know our dreams are God-given? How can we be sure we’re listening to the Spirit and not just following our own desires? Booram offers some of her best advice in response to this question: “Pay attention to what you are praying. . . . Prayers related to God-inspired dreams seem to be irrepressible” (p. 36). Also, discern whether you are feeling “drawn” into this new life, or “driven.” A feeling of being driven is often more indicative of human ambition or temptation, while God often invites us into something new through visions to which we’re genuinely attracted or drawn (p. 115). As a church planter in Pittsburgh, Pennsylvania, I recognized many of the dynamics Booram names: the time someone told me to plant a church and I responded with skepticism (p. 97), the ambivalence one might feel after a dream-deferred again becomes possible (p. 133), the challenge of adjusting to the “new normal” of life in this dream and developing rhythms to keep it sustainable (p. 163). I can see retrospectively how relevant this book is for church planters. What a gift it would have been to have it as a handbook seven years ago. Read this slowly and reflectively. The stages of discernment and growth Booram describes can spread out over many years. Let this be one of many companions in discernment throughout the long and joyful journey of starting something new. Thank you to InterVarsity Press for providing me with a copy of Starting Something New so that I could write this review. In early 2013, Dave Harrity came to Pittsburgh to lead a writing workshop at The Upper Room. I wrote after the workshop that those who attended “came expecting to write, but left seeing our whole neighborhood through a different lens.” Poetry can help us develop a vision for transfigured reality. Dave’s guidance that day did just that: by writing together we pulled back the veil and glimpsed in a new way what the Holy Spirit was doing among us. Now Harrity has a new book of poetry out called These Intricacies. In it, he gives us glimpses of latent glory in the hills of Kentucky, the mysteries and challenges of fatherhood, the passing of seasons, and the endeavors of prayer. Though he has playful moments, the collection is sobering. Harrity’s pictures of family relationships are mysterious and full of longing. Firearms appear dangerous and unpredictable. Prayer yields frustration and bewilderment. Fitting of our present turn of seasons, Harrity returns often to the humbling effect of winter calling it “Proof positive / that all you make can’t be that important after all”. A spring snowstorm smothering newly blooming flowers is God’s “way to remind us / that death is just / another word for patience.” One hears in these words a reminder that “everything is vapor,” that we are quite small in comparison to the grandeur of creation and the mysteries of God’s schemes. From this place of smallness, Harrity searches for signs or sounds of hope. Musing on the rock fences of Kentucky – first built by Irish immigrants and then by black slaves – “How does a wall get made into an altar?” Can something which seems to be a monument to violence or injustice be transfigured into something beautiful and holy? Like the imagined altar made of stones once handled by slaves, the glory here is potential, latent. Seeds of the new creation have been planted, but are not yet emerging, and hope still lies beneath the surface of ground. In theological terms, there’s no over-realized eschatology here. By offering a sobering vision of reality, Harrity invites us to search for what is true, what endures, what truly matters. This is wisdom literature, an invitation to patience and slowness, an invitation to near-contentment. After many poems of prayerfully questioning God’s silence and seeming absence, Harrity offers an image of himself fishing with his father, “all right with saying nothing.” God’s silence may not yet have been broken, but a lakeside moment with a father reveals a relationship beyond words. This is wisdom: to search for communion in patient silence. The pieces collected in These Intricacies are poems to inspire that search. Thank you to Cascade Books and Wipf and Stock Publishers for providing me with a review copy of These Intricacies so that I could write this review. When I heard the news that Phyllis Tickle passed away Sept. 22, 2015, I wondered what office of prayer she had just completed. I imagine that a woman who led so many into deeper practices of prayer would surely pass into the fullness of the Kingdom by way of prayer. In her own prayer-book, the Vespers office for the night before she died included a hymn with these words: “So when the world is at its end / And Christ to judgment shall descend, / May we be called those joys to see / Prepared for all eternity.” The refrain for that Vespers service: “Let the faithful rejoice in triumph; let them be joyful on their beds.” By grace we trust that Phyllis now sees those joys with the Church Triumphant. Tickle was the founding religion editor at Publisher’s Weekly and a prolific author, but her influence on the Church extended far beyond books. She supported and sponsored many voices in the emerging church movement, lending credibility to a phenomenon that others regarded with suspicion. She used her publishing savvy to bolster budding authors and bring fresh voices to the Christian publishing market. But her greatest contribution to the Church was how she taught a new generation of Christian leaders to pray in a very old way. The one conversation I had with Phyllis took place with a group of other Pittsburgh pastors at a local bar after she spoke at Pittsburgh Theological Seminary’s Summer Leadership Conference in 2012. After the table had talked about the paradigm shifts affecting our culture and the Church for quite a while, I offered a quick interjection: “Phyllis, thank you for The Divine Hours.” She lit up. Then with joy she recounted the story behind her greatest works. The Divine Hours was Phyllis’ biggest writing project – a series of prayer books revolving around the practice of fixed-hour prayer. Long maintained by the monastic wing of the Church, fixed-hour prayer involves pausing to pray at specific, predetermined times throughout the day. The early Church inherited this practice through its Jewish roots. Psalm 119:164 says “Seven times a day I praise you for your righteous laws” and this verse was taken quite literally in Jesus’ day. By the time of the Apostles, praying liturgical prayers up to seven times a day was a common practice in Jewish religion, and the Apostles maintained such practices even after Jesus’ death and resurrection. Acts 3:1 shows Peter and John going to the temple “at the time of prayer – at three in the afternoon.” Peter and Cornelius are practicing fixed-hour prayer in Acts 10 when they receive the revelations that lead to the inclusion of the Gentiles in the Church. In the history of the Church, these have been systematized in various ways by different traditions. A simple list of some of the key hours includes (1) Vespers – 6:00 p.m., (2) Compline – Before Sleep, (3) Midnight or the Night Watch, (4) First Hour or “Prime” – 6:00 a.m., ( 5) Third Hour or “Terce” – 9:00 a.m., (6) Sixth Hour or “Sext” – Noon, and (7) Ninth Hour or “None” – 3:00 p.m. An attentive person will notice that the prescribed prayers for certain times often refer to biblical events which occurred at those hours. For example, many Third Hour prayers ask the Holy Spirit to fall upon us as a Pentecost. Ninth hour prayers may ask that our sin would be crucified with Christ. When practiced regularly, fixed-hour prayer becomes a way of weaving the story of Jesus and the Church into our daily lives, increasing our attentiveness to God and our sense of identification with Christ and the Apostles. By writing The Divine Hours, Phyllis opened up the practice to a whole new audience. Many were transformed by adopting this new rhythm of prayer. When other prayer books could quickly become stale, The Divine Hours offered fresh sets of seven offices for each day of each season of the year, with each prayer painstakingly selected by Phyllis. When other prayer books felt clumsy to operate, The Divine Hours arranged all the prayers and readings one needed for a given office on one page. Ken Wilson, a Vineyard pastor in Ann Arbor, Mich., wrote about the Divine Hours: “I was able to relax with this kind of prayer. It didn’t depend as much on my state of mind or my feelings of spirituality at the time of prayer. It felt like dipping my canoe into a river of prayer that has been flowing since the time of Abraham.” Wilson was so enlivened by the practice that he convinced Phyllis to let his church post a regularly updated version of the Divine Hours on their website. 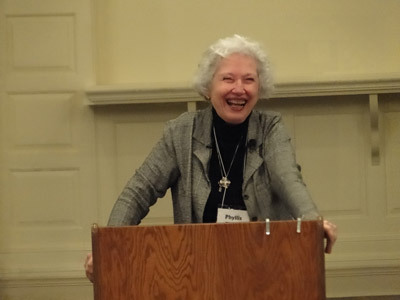 Videos of Phyllis’s presentations at the Summer Leadership Conference are available at https://www.youtube.com/watch?v=KNuifQCVOd4. On March 17, Americans celebrate St. Patrick’s Day. Cities like Pittsburgh celebrate with parades. Revelers will indulge in Irish-themed food and drinks, even beer that’s been artificially dyed green. Amusing and entertaining as these festivities may be, they reveal little to us of the glorious ways God moved through humble Patrick’s life and ministry. Like St. Nicholas – the fourth-century bishop who rescued impoverished girls from prostitution, but whom the world has transformed into Santa Claus – St. Patrick was a saint whose original story of holiness we need to hear afresh today. The real St. Patrick was a man of prayer and discipline as well as an evangelist who baptized – by his own account – “many thousands of people.” And that means that St. Patrick sets a valuable example for those of us who seek to start and lead new churches today. Patrick was humble. He begins his Confession with the words, “I am Patrick, a sinner, most unlearned, the least of all the faithful, and utterly despised by many.” Patrick confesses that he’s uneducated and a poor writer. He talks about his failures more than his successes, sharing how his trials were used by God to sanctify him: “. . . thus I was purged by the Lord and He made me fit so that I might be now what was once far from me – that I should care and labor for the salvation of others, whereas then I did not even care about myself.” When he does mention his successes, he’s quick to attribute them to God’s power working through him, never his own strength. Patrick knew Scripture inside and out. The edition of the Confession which I’m citing here italicizes every allusion to the Bible. The effect is startling: Patrick couldn’t go more than a few sentences without quoting Scripture. He interpreted every major event of his life in terms of Scripture. His knowledge of Scripture went beyond academic knowledge to form and shape every aspect of his life. Patrick was a man of prayer. Patrick recounts that as a teenage shepherd, long before his public ministry, he prayed hundreds of prayers each day. Fasting and nighttime prayer vigils were regular parts of Patrick’s life. This life of prayer both prepared Patrick for the powerful ministry which God performed through him and enabled Patrick to discern God’s call upon his life. In a scene reminiscent of the Apostle Paul’s vision of the Macedonian man in Acts 16:9-10, Patrick had a vision in which a man from Ireland begged him to come back and minister there. Prayer determined Patrick’s participation in God’s mission. Patrick did not seek his own gain. Near the end of the Confession, Patrick insists that he never charged fees for the ministry he performed. He writes, “I know perfectly well, though not by my own judgment, that poverty and misfortune becomes me better than riches and pleasures. For Christ the Lord, too, was poor for our sakes; and I, unhappy wretch that I am, have no wealth even if I wished for it.” Patrick knew that he was not called to profit from the gospel, but to give his life freely in service of One who had given him new life. Do we acknowledge our failures and embrace our hardships, letting God use them to grow compassion and humility within us? How deeply has Scripture shaped the pattern of our lives? Do our visions for ministry come from God through prayer, or from our own ambitions and egos? Do we love the people to whom God has sent us so deeply that we would stay with them no matter the cost? Patrick’s world was not that different from our own, and Patrick’s ministry was fruitful not because he became like the world around him, but because he pursued God with zeal and unflinching devotion. 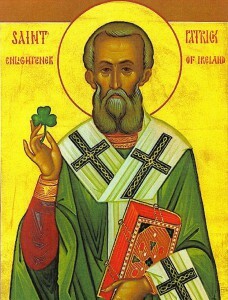 May God give us the humility, prayerfulness, and faithfulness of the real St. Patrick. This post was first published on the Pittsburgh Theological Seminary blog.